This small town in Matanzas Province, about 50 km south of Cárdenas, was a center of sugar mills and tramway mysteries. The steam railroad from Cárdenas reached Navajas, 4 km west of Pedro Betancourt, in 1844. 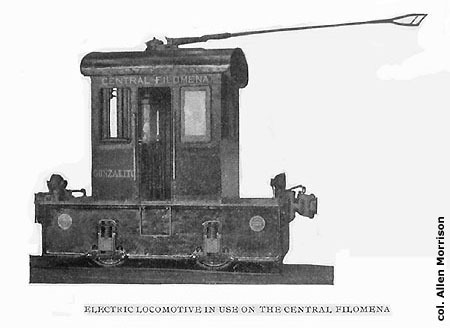 A list of plantation railways in the March 1908 Cuba Review says that the tracks at the Enriqueta mill in Pedro Betancourt "are wired overhead for electric trolleys, but electric motive power was not now used." The Santa Filomena mill was renamed "Enriqueta" in 1907 and "Cuba" in 1909. It still operates today as the "Cuba Libre". The online Historia de la Provincia Matanzas [no longer online!] states: "En 1907 hubo en Pedro Betancourt un tranvía que rendía viajes de la Cabecera Municipal al Central Cuba, el cual poseía un solo coche y fue traido de Francia. Utilizaba una línea que atravesaba la calle Martí y su funcionamiento duró muy poco tiempo" (In 1907 Pedro Betancourt had a tramway that provided transportation from City Hall to the Cuba Sugar Mill. It had a single car imported from France which used track along Calle Martí and its operation lasted very little time). It is tempting for the author to fantasize that Pedro Betancourt's tranvía was towed down main street by an electric locomotive discarded by the Santa Filomena sugar mill. Could that have been the case? Does anyone know? If someone does, or has any information or other ideas on this subject, will he or she please send me an email! Thank you! The author is grateful to Allen Copeland for order information about the Baldwin locomotives. "Modern Applications of Electricity in Cuba." Cuba Review (New York), February 1905. Photo and description of the Santa Filomena installation, pp. 6-8. "The Plantation Railways of Cuba." Cuba Review (New York), March 1908. Description of the Enriqueta line quoted above, p. 19.